Stephen Wickens has written a thoughtful column regarding bike lanes (“Bike-lane debate comes full cycle”, Sept. 5, 2017). As a cyclist, I value bike lanes. However, I also walk, use public transit and drive. Many or even most families use a mix of transportation modes. I disagree with the premise that transportation patterns will adjust and everything will be fine. Systems do adjust to new equilibriums as conditions change – but that does not necessarily mean that the new equilibrium is good. 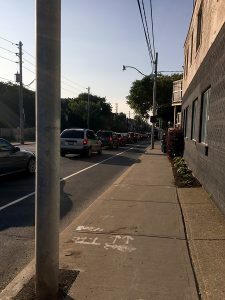 I took a photograph of Woodbine looking south from Kingston road during the morning peak – soon after the bike lanes were painted on (see photo at right). The stretch of road is now gridlocked. The intersection is now over capacity. Traffic is queuing back on Kingston Road, holding up westbound transit vehicle. When I took this picture, the southbound 92 Woodbine was stuck in the backup on Woodbine. Before the change, this was a busy but functional intersection. There is very little historical evidence of Toronto Transportation tweaking things in a meaningful way. Let’s get one thing clear: I love bike lanes. But the Woodbine bike lane must be removed. The only way to more effectively slow traffic would be to erect a concrete barrier across all lanes. The other day I took a bus ride from Kingston to Danforth on Woodbine. The trip took 14 minutes in heavy traffic – just a fraction faster than walking. But I was lucky to catch the bus where and when I did. At every stop, huge crowds could not board the now-full vehicle. “We’ve been waiting half an hour!” someone told the driver, who shrugged and responded: “Sorry; there’s only one lane.” At the subway, the platform was dangerously crowded with people waiting for the bus to finally arrive. The reduction in driving lanes has brought traffic to a near standstill, with cars and buses idling and contributing to street-level pollution. Smart drivers will take to the side streets. I don’t want them to – I live on one – but I can’t blame them. Our local councillor has said the lanes can be “tweaked,” but nothing short of removal will solve this problem. Oh, and ironically there was one thing I didn’t notice during my hellish bus ride; bikes. I am an Upper Beach resident living on a side street off Woodbine Avenue. I am writing to express my support for Ward 32 councillor Mary-Margaret McMahon and the City of Toronto’s plan to create an integrated system for all modes of transportation. I love the Woodbine bike lanes. I ride my bike to work everyday because it takes half the time that taking the TTC would take me to get to work and back. I’m healthier because I ride to work and to go shopping. I also ride for environmental reasons. Riding means I can leave my car at home. This is a lifestyle choice. I have ridden on roads without bike lanes and I have seen some frightening incidents where motorists speed past cyclists far too closely to get to their destination. I feel safe on the Woodbine bike lanes. It has encouraged me to ride year-round because I know I have a designated space where I can ride safely even in rain and snow. I also appreciate the division of parked cars as a buffer between the motorist and the cyclist. To those who in theory agree with bike lanes but not the execution of the new lanes who now feel that they can’t support it and are petitioning for their removal, I ask, are you upset because the changes may force you to change your habits? Who wouldn’t get in a car instead of the TTC or a bike, right? It’s so easy and comfortable. The problem is that it’s not practical or sustainable. There’s tons of information about the pollution that single-occupant motorists create. Now imagine all those single-occupant motorists along Lakeshore all the way up Woodbine Avenue. There is the concern about road safety for pedestrians. I agree that traffic calming measures need to be put in place including narrower avenues to reduce driving speeds! If people want to be proactive, they should consider leaving their cars at home and take the GO/TTC/bike to their destination. This said, we must continue to be vigilant with the safety of our youngest children while teaching them road safety at the same time. I expect the city to do it’s job. I believe that’s their intention. 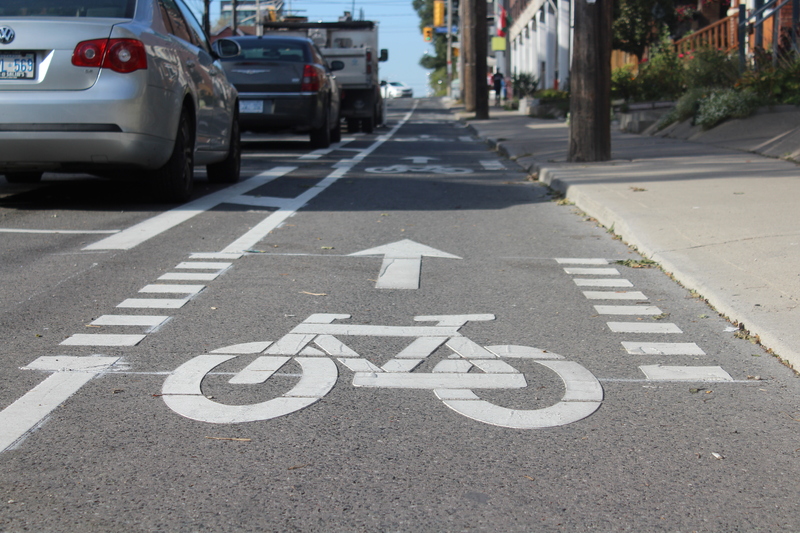 I support the bike lanes initiative and I look forward to a more sustainable Toronto. Woodbine Avenue is a major artery in the east end. For years it supported five lanes of traffic at certain points. As of September, it now has essentially two, the result of the addition of bike lanes. What were city planners and our local councillors thinking? Where was the due diligence on this project? Where was the traffic study? The immediate result of the implementation of these new bike lanes has been major traffic congestion from Danforth right down to Queen during rush hour and beyond. But this is not just a matter of inconvenience – it is an issue of safety. Frustrated drivers, in their haste to get out of the daily gridlock of Woodbine, are now cutting through quiet residential streets (mine included) at unacceptably high rates of speed. There are children playing on these streets. In addition, people parked in those strange floating parking spots on northbound Woodbine run the risk of stepping into an oncoming car. Collisions have already occurred stemming from the lane restructuring. No matter how much the city trumpets the benefits of bike lanes, this project has caused major safety issues. Any comprehensive, competent study would have yielded the same conclusion. The city has responded saying it is making “improvements.” (Our councillor Mary-Margaret McMahon calls them “tweaks”.) But any additional signage and pavement colour-markings will only serve to add to the confusion. Residents, in general, are not against bike lanes, but no one expected a design this bizarre. Woodbine is no longer a street — it’s a surreal obstacle course. And, despite claims to the contrary, the bike traffic since the installation has been minimal. Woodbine has not suddenly become the Beach’s answer to Amsterdam. Realistically, in the dead of a January winter how many bikes will be peddling up Woodbine past the cars eternally stuck in rush hour gridlock? Bike lanes on Woodbine were ill-advised, poorly conceived and a serious misstep that has created more problems than it has solved. It’s flawed at best, potentially tragic at worst. Mayor Tory has made it his goal to “get Toronto moving.” This project has achieved the opposite. How it was approved is a mystery. So far, 3000 people and counting have signed a change.org petition to remove the lanes. Bike lanes: Yes. On Woodbine Avenue: No. As I walked south from Woodbine Station on Woodbine Ave. last Friday evening I couldn’t help but notice the large number of vehicles moving north, as well as the relatively small number of bike riders using the bike lanes, hardly any pedestrians using the sidewalks and few homeowners enjoying their front lawns. It was then that I realised the best use of the limited space on Woodbine Ave would be to remove the bike lanes, tear up the the sidewalks and the expropriate the under-used front lawns. With these inconvenient nuisances removed, and the burial of the hydro lines, Woodbine Ave. could be easily expanded to six lanes of trafffic, room enough for cars aplenty and parking for all! During the blizzard on Monday Jan 28th, many TTC riders were stuck at Woodbine Station for over an hour in record low temperatures. Woodbine Ave. was at a stand still. Is there any cyclist in the city that thinks workers, seniors, children and students should stand in frigid temperatures so that the bike lane turns two lanes northbound into one single file lane that does not move? Any one who thinks that is OK should be ashamed of themselves. Anyone who thinks bicycle lanes cause TTC slowdowns should first look at cars without snow tires that can’t handle Canadian weather. When there is only ONE traffic lane, vehicles with snow tires cannot go around the “spinners”. There is only one traffic lane since the other lane has become parking 24/7 . Parking used to not be allowed during rush hour. Parking is allowed all the time now along Woodbine, as the bike lanes, in their very poor design, weave about and it is not possible to change parking into a drive-able lanes for rush hour..
Also of note that TTC buses do not have snow tires but manage to get up Woodbine with all season tires. But the TTC bus cannot get up the hill if they are stuck in ONE lane. I am a biker and a runner and a commuter. I think bike lanes on woodbine are a terrible idea, proof is in the inflated commuting times. I pefer biking on greenwood anyways – much quieter and safer. Time for them to go!